Posted May 25, 2016 by La Lune Collection & filed under About La Lune Collection, Interior Design, Rustic Furniture, Rustic Seating. This year’s showhouse – which opens to the public on Saturday, June 4th – is a spectacular beauty, commanding a magnificent view of the western shore of Oconomowoc Lake with its magical sunsets and pristine waters. This grand, renovated, turn-of-the century home boasts 8,100 square feet of breath-taking splendor; the Neo-classic Lake Country house has five bedrooms, five fireplaces, a guest apartment with sleeping porch, and five full baths. For the sixth straight year La Lune Collection has made the decision to whole-heartedly support this important cause by creating a space in the ‘Showhouse for a Cure’. This year, all showhouse visitors will be greeted upon their arrival at the home’s front porch, which is paved with Savannah stone and Bluestone and bedecked with beautiful rustic furniture custom-crafted especially for the installation by La Lune. Among the pieces that La Lune Collection has created for this particular showhouse are a charming Chippendale-inspired settee, an armchair and ottoman featuring hand-notched details, a side table, planter, and a bench – all handcrafted of locally sourced poplar branches. All furniture on the 2016 Showhouse for a Cure’s front porch is finished in La Lune’s Whitewash, to coordinate with the home’s wall and trim paint colors. Upholstery is done in Sunbrella ‘Stone’ fabric, the perfect foil to both the home’s exterior paint color and the Bluestone slate porch tiles. 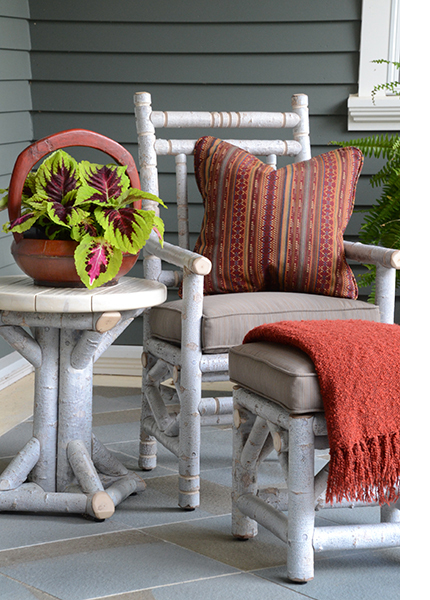 To complete the look, the installation is accessorized with rust colored pillows, throws, and a planter fashioned of poplar branches which is finished in Redwood. We hope to see you at the showhouse, June 4 – June 19, 2016!